She reaches for my hand and smiles. I reach for hers and I force a smile back, force myself to look truly joyful. I want her to know joy here. I want to know joy here. At 26 years old Betty is the beautiful mother of a 3 year old little boy. She weighs 69 pounds and battles AIDS, tuberculosis and all the complications that come with the two. We know the drill. She reaches out her hand and it reminds me so much of a hand I held once, of a woman I loved hard, of a friend who became a family member. I fight the tears and I force a smile. After all, she might live. She could live, and right now, I know she needs me to believe that she will. How do you keep believing that when the last time you were wrong? When the time before that, and the time before that you were wrong? I sit down on the side of my couch that is now her bed and I ask her about her family. A hot feeling surges up in the back of my throat as I feel my heart start to put up a wall. I know better. I should know better. After all, my job is to believe with out wavering. His job is everything else. I resonate deeply with this woman. I can see her, reaching out for his hem. I can feel the strain, that desperate reaching, longing just to touch Him, just even the very edge. A longing for only Him. I am the woman with the issue of blood. Except I am the woman with the issue of doubt. I am the woman with the issue of sin, with the issue of flesh, with the issue of forgetfulness. I am a woman who wants to snap my arms shut and protect, fold my arms tight around this chest to guard my heart that is still so raw and exposed from being broken. I want to gather these children to myself and shelter them from the ugly hurt of this world. And do you know what? He isn’t out of reach. I stretch out my arm and I realize that He is right here, just two steps in front of me, clearing the way. The sweet promises of Isaiah flood my mind, “His robe filled the temple.” I reach and I feel that His hem is wide, enough for me and for you and today and tomorrow. Enough to fill and enough to overflow. Some time last week in the too-early hours of the morning, I asked God why He allowed me to believe so strongly that Katherine would live when she wasn’t actually going to. I can usually get a pretty good sense for those things. It is hard for me to think that My Father saw me in my hope, He knew I was believing, and He simultaneously knew the ending. I think He answered that He gave me the grace to believe that she would live so that in her final days she would feel hope and high spirits all around her, so that she would feel that she was fought for and that she was worth the fight. She was worth it. Its His message to us on the cross and it is His message to the woman with the issue of blood as He stoops down to look into her eyes, to speak to her, to meet her need: “You are worth it.” And I want it to be my message to these hurting that He brings into our lives: You, you are worth it. We are for you. He is for you. I want my life to be found in chasing after Him and I want my arms to be filled, not just reaching for, but gathering in the hem of Jesus. His robe fills the temple. His glory fills the earth. I want my arms to be filled with gathering His grace, His love, His goodness. I want to follow Him wherever He is going and be so full of Him that He is overflowing out of my arms, out of my very life. Even when it means reaching out my hand with a smile to a situation that might hurt, will hurt. He gave me the grace to hope. And so I am asking that He would give more grace, again, even if it is harder to grasp this time. Grace to feel joy and grace to hope for life and grace to fight hard, because people are worth the fight. Grace to have arms so filled with Him that they have to remain open, and that He spills out. I look at Betty and my joy is real. We open our arms to her because she is worth it. And I wanted you to know today, that you are worth it. He fought for you. You reach, and He bends, He cups your face in His hands and He says, “Take heart. Be healed. I am for you.” I pray we would know deeply His love for us. I pray that we would fight for His love in this world because we know. Keep reaching, friend, He’s right here. His hem is wide. Let's fill our arms with gathering it. Katie-what a beautiful living picture of the gospel! The Hetherington family will be praying for Betty and that God would continue to fill you up as you pour out His love. God bless you and yours! Brent & Raqi H.
This post moved me today. Thank you. "No,no, she isn't crying. She is just shiny"
"Well no." I could see from his face that he was trying to find the right description for your face. "No, she is joyful. hmmm...maybe"
"Well, I think she is shining joy - yes, that's it. Shining joy." Thank you for shining joy in hard places, reflecting His glory. I will be praying, Katie. God can heal her. I know what it is to battle with doubt - it's daily for me. But God knows our doubts, and he is able to extinguish them. He is also able to do far more than we can imagine, as you know. I will pray for Betty's healing - and for her to be filled with hope and peace in the midst of what she is going through. Thanks for sharing. Thank you for this perspective...we need to believe in healing to cement the right of the infirm to hope. Thank you for opening my eyes. We are praying for Betty and your family! Thank you for sharing so that we might pray with you! I am praying for you and Betty and your sweet family! Seeing similar situations occur and end differently than we hoped is disheartening. Praying that God provides you with a peace beyond all understanding! Katie, thank you for using the gifts God gave you to put into words what so many need to hear. Even in your rawest pain, you let Him use you for the good of his kingdom. And thank you for letting me use you as an example of faith to so many others. you are such an inspiration to me. LOVE reading your words about Jesus. Thank you! Such a lovely inspired message,as all truth is !!!! We are united in prayer for her, for you and your ministry. God is right there with her. He will provide, no doubt in my mind He will provide what she needs. Amen. I am praying now for Betty, and for you. For her ~ healing,peace,comfort,mercy. For you~comfort knowing you are doing the eternal right now no matter the physical outcome. You are loving as Christ loved~His arms, His eyes, His feet, His love. God can and does heal miraculously, but He's already accomplishing the eternal through you. Be blessed. I am praying for Betty now, and for you. For her~ healing, comfort, peace, and mercy. For you~ comfort knowing that you've already accomplished the eternal no matter what the physical outcome. You are His hands, His feet, His arms, His eyes, His love. No matter what happens physically here on this earth, you've already touched eternity with these precious lives you're ministering to. Keep loving. Keep hoping. Keep trusting. He is for us. :) Be blessed. My heart longs to feel the things you feel; the hope, the grief, the nearness of our God, the weight of sin, the hope of eternity, and love for my neighbor. It is so hard to stay close to God in America; you, my sister, our blessed to not have so many distractions in Africa. My husband and I sponsor two kids through Food for the Hungry; Dicken is 14 and lives in Tikoling, Uganda and Claudine is 8 and lives in Gisanga, Rwanda. In my heart they're my kids, even though I've never met them. I pray that God will allow us to see them this side of heaven as well as meet you. Praying for you and so encouraged by you. Oh Katie! You inspire me beyond what you know. Here I sit in my house in Madagascar...just soaking up everything you say. I want so desperately to make a difference. To be the Hands and Feet of Jesus! I pray the Lord will show me what that looks like for me! Even though we are about the same age...I look up to you and admire you! So thankful for all God is doing in and through you. I long for every post you write. When I begin to question what the Lord is calling me to do...I just read your blog and am reminded once again! I want to go to the Nations! I want to be used!! THank you for your honesty and humbleness!! I love you and am praying for you and this sweet, precious lady!! Katie, my daughter (who's 21) and I are going through your book. Your story is rocking out world! This is good-Great! The fire and closeness of the Father was just about gone. Your story had given me a new hope in Christ. I'm sure you've heard a million times (which you should) how big your heart is and you really put many of us to shame- but this is good. I wish so badly to come and help, but I have my family here. I've been praying for you and your work. I know you'll keep going and people like Betty shake your faith a little, but you'll not waver. I think He likes our faith to be tempted then he sees how faithful we are when we still believe. Do y'all need blankets? I love to read your posts. You may feel small but you are huge in these peoples lives. To give them hope, faith and respect. Thank you for doing God's work. When He healed her He not only healed her physically but emotionally and spiritually as well. He restored her to her place in community. She is the only one He calls daughter. Prayers of blessing for healing and restoration for you and all you care for! Katie...God bless your heart! I cry every time I read your post, blogs, etc. Your faith and love and life convict me every day...and challenge me to live out my faith...to seek and do a life that is real and matters. When I see what you do, your daily sacrifices for others, the raw love you show, as a young woman in a place far from 'home'...I am ashamed of the wasted years that I can't get back. I pray that even though I'm over 60, and now profoundly deaf, that somehow God can use me...and that He'll give me just a fraction of your giving heart!! Katie...I am so happy to learn that you spent some treasured time last week w/my next door neighbor and friend Shay Buttolph. She is there again...working for a way to have Sudanese orphans adopted. You are in our prayers...always! My husband and I were in Ethiopia a year and worked in China until recently. God enabled us to establish some underground churches! HE is most awesome. Prayers for you...and Betty...and the family there...all of them. Katie, thank you for posting this today. It was beautiful and so well-written. As always, it was sorely needed and came with perfect timing. I've been struggling with my faith lately. Love is so hard sometimes. Just wanted to say thank you and let you know that you're in my prayers. Simply beautiful. Praying for Betty. I will be praying Katie for you and the many needs of the people you serve -thank you for being the hands and feet of Jesus. Lets all ask God to give us the grace and power to keep our hands and arms open - love to you and your ministry. Your words are sweet and loving and encouraging...never lose hope...each life is precious and we all find our hope in Him. You have encouraged me greatly tonight as I read this and your words have brought hope into my life! Thank you so much for your work, your beautiful words and your devotion to the One who brings us all Hope! Katie, this is absolutely stunning. On an unrelated note, on my website, I do this thing called "The Week In Review" where I list the favorite things I've read lately. But none of your posts have a specific URL. Is this on purpose? Oh Katie. You are not alone in this wondering. And yet, you are not alone. Ever. His presence, with you, and this post, fills me with such courage. To believe, because of grace--not because of assurance. Praying for you, friend, that you will know the kind of love that is so high and wide and deep that it will flood you with joy in the hardest of moments. e.
I will be praying. I read your book as a preparation for a trip to Uganda in a month. It was such a blessing. I bought another copy and am passing them around to the other team members. The amazing thing is that one of our team members met you on a previous trip. You are such an inspiration. We will be in Kayango. Would live to meet with you, but I'm sure that is nearly impossible. Thank you for your honesty in sharing your feelings. I will be praying. I read your book as preparation for a trip to Uganda in a month. It was such a blessing. I bought another copy and am passing them around to the other team members. The amazing thing is that one of our team members met you on a previous trip. You are such an inspiration. We will be in Kayango. Would live to meet with you, but I'm sure that is nearly impossible. Thank you for your honesty in sharing your feelings. katie, i just finished reading your book and cried most of the time specially about your amazing stories but most of all praising God for his amazing love shown through you. what you're doing is beyond words. you have inspired me to really show the love of Jesus intentionally to people around me. Hello Katie, I don't know if you will read this post or not, but I am so moved by your life to glorify God as you walk in obedience. God has been preparing the way and after reading your book, I have decided to be obedient. As I read your posts I become afraid of being hurt the way you have. However, you have shown time and time again that God's grace prevails. I will be going to Guatemala for all of August and I will be living in an orphanage that's also a home for preganant teens which provide parent training. I am working extra hard to pay off my debt and loans to eventually make the move. Thank you for your example, though I know you have struggled I know that you are seeing things through the eyes of God. I will be praying for you and the beautiful people whom you are helping through Christ our savior. Betty will remain in my prayers. Last Friday I was trying to send a comment to ask you to please pray for me. When I took a look today, I found out that you already were! Thank you for having courage for so much hope! Thank you for sharing Katie, so thankful that Betty has you to bring her the hope of Jesus. I am praying for y'all. Holy, holy, holy, Lord God Almighty, please hear and receive prayers for Betty and her son and her family and her salvation. Her body is weakened and wracked with sickness and disease and failure... but her heart may be receptive to the Call of Jesus, "I stand at the door"... may Betty open that door and allow Jesus into her heart to HEAL her!! Not necessarily a physical healing, though that is our prayer and hope, but a healing of the heart and soul and mind - to be cleansed by the preciously shed blood of God's only Son, Jesus Christ our Redeemer! Father, Spirit, Son, please also accept prayers for Katie and her family and the Amazima Ministry team. Accept words from Your Holy Scriptures used as prayers: from Nehemiah 6 I pray a prayer for Katie "Remember in my favor, O my God, everything I've done for these people." and also, a few verses later "give me strength." From Romans 15 (The Message)accept verses one and two as prayers for Katie and her team, "Those of us who are strong and able in the faith need to step in and lend a hand to those who falter, and not just do what is most convenient for us... Each one of us needs to look after the good of the people around us, asking ourselves, "What can I do to help?" ". Truly Amazima is seeking to help those around them. Strengthen them. Equip them. Use them as they Glorify THY Holy Name!! Praying for you all! So inspired to action in my faith because of your ongoing journey, Katie! Keep it up! I will make sure to pray for Betty. Thank you. And by the way, I finished your book. I would recommend it to anyone. You are an inspiration on how to reach the sin-torn world with the love of Christ. Thank you for being obedient to your call and for your beautiful heart. And by the way, I just finished your book Kisses From Katie. I would recommend to anyone. Praying for you all. So convicted by your post. I am also wrestling with doubt and my need seems so shallow as I read this. Praying God's healing and His blessing. Joining you in praying for Betty. As you lay your hands on her in love may God's kingdom and healing power flow through you onto her, and may you be flooded with faith! I teach high school English literature here in Texas to a group of home schooled students. They are 15-17 years old. Your book was their reading assignment for the past two weeks. We will finish discussing it tomorrow. I wanted to show them your world in the hopes of inspiring them to think outside the box. I wanted them to meet a present day hero. Thank you for writing your story. Thank you for being such an example and someone these students can relate to. May God continue to heap blessings on your life. your persistent search for faith and following so hard after Him amazes me. praying for you and betty. your persistent faith and desire to follow so hard after Him amazes me. praying for you and betty. Thanks for sharing your life with us . . . your joys, your trials, your hope, your pain. The LORD just gave us fresh HOPE for our trauma-filled daughter. You can read the story of her MIRACLE on my blog today. Prayers for you and your precious family! God bless you and your dear friend! May SHE feel HIS LOVING ARMS SURROUNDING HER! Keep loving them and showing them JESUS! You are preparing them for their special meeting of their Savior. When they reach the shores of Heaven and see Him face to FACE - they will not only be touching the hem of His garment - but THEN - they will dance with Him - dressed in white - all pure and clean and without disease - in new glorified bodies and He will look into their eyes as they dance and say in His sweet voice, "You were well worth dying for, my Beloved." Thank you Katie. What a beautiful vision that you have. I loved the idea of holding on to so much of His hem that it spills out to others. Yes!!! My heart has been burdened for you these past few weeks. I'm so grateful for your transparency - you're walk is helping me open my arms and my heart in spite of past hurts over loss. I'm praying for you and though you'll never know me, I trust our Father to bind our hearts for his children. My heart has been burdened for you over these past months, as I knew you were grieving for your loss. Thanks for sharing this, and for always being so transparent. God is using you beyond your ministry there, Though we will never meet, you've touched my life. Thanks for reminding me to open my arms to reach him and them today! my heart too draws great strength from the lessons in the story of the woman with the issue of blood...did she know she would leave such a legacy of faith? do you? my heart is full after reading your post, comforted in your strength, smiling at your choice to find the joy in this process of loving and opening ourselves to the mess and pain that come from allowing others in. Working on walking with God in Colorado...praying for your walk today in Uganda. As you touch the hem of his robe, may you be empowered, sustained, healed. Thank you for sharing your heart; thank you for serving Jesus. Katie, I am so sorry for your loss, but I thank God for you every day. These women, children, and families that you share your heart with are blessed beyond measure. It's sad whenever we lose a loved one, but the reunion you will have in Heaven with all of the souls you have touched will truly be grand. Thank you for your shining example of devotion to our Father in Heaved and to His Son, Jesus Christ. And thank you for showing us what it means to truly be a disciple of Christ. Good luck to you and much love. Dear Father God, I pray for Betty that you would continue to give her joy in the midst of suffering. Thank you for Katie and others you are using to love her with the love of Christ. I just can't imagine life without You. How can we survive without You Lord. You give us purpose and meaning and value. You value Betty and you are so proud of Katie and her helpers for loving so many like this precious woman. Please bring extra help for Betty. Whatever she needs we know you will provide if we ask. I don't know her needs but you do Father. Please give it to her abundantly! !Multiply the love and the blessings to her Father! We love you so much and we know you love her.Thank you for hearing my prayer and help me to continue to pray for Betty as you lead me. Praying with you is often a difficult journey for us as we go through the joys and disappointments of broken lives, sometimes being healed here, and sometimes being gathered into our Father's arms. Know that we are praying with you, for Betty as we have for Katherine. Thank you again for the encouragement we receive through you from Him as we are reminded of His goodness, love and grace. Dear Katie, thanks so much for your blogs. I love to read it! Thanks as well for your book. It is such a encouragement to live for Jesus! Praying for Betty. Praise the Lord that He is big enough for all of our needs and that He loves us with such an all consuming love. I am so blessed by your blog and ministry. Praying Jesus strengthens you today and continues to provide for you! I'm praying and hoping right along with you, Katie. I pray that Jesus will hold Betty in His healing hands and flood her heart with His joy. Dear Katie, As family and friends and the lost all around me are sick and solutions are few(in the world), I've cried out, "Jesus, I believe! I want to believe, I have seen Your miracles, and I want/I need to see Your healings.. here... on earth." As I looked at the picture of Betty, I asked, "Please, Lord, can we see Betty be healed. We believe. Katie needs to see her healed. I need to see her healed. Her daughter needs her mother." It's not really about 'our' needing it, is it Lord? But, You know.... You know why we struggle each time it doesn't happen. We don't want to doubt.And we know the joy of witnessing Your healing power. That joy strengthens us. So, as I'm here in this moment, I hear, "This one will be healed". I praise You, Jesus. In whispers, I praise You. Tear flow, and my heart beats faster and faster. Thank You, Jesus. You are so sweet and mighty. How is Betty? Is she still with us? Katie, this post moved me to tears. You are truly blessed. What a great message! Thank You Katie! The hurting of this world are worth it! This gave me hope. This lifted up my soul. Father lifted up my soul. Filled it with His love while reading this. And the tears that are falling from my eyes are melting the walls i have put up to guard my heart from not getting hurt. But who loves deeply, also hurts deeply. His love covers the scars. 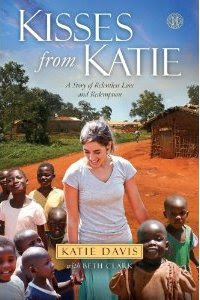 Katie, I am 39 years old and have been a "christian" my whole life...I just read your book this weekend and now I am praying that God will help me to love Him and love others like a young 20-something girl in Uganda...i'm praying that God will help me to surrender my all to Him, and take away my fear and caution so that He can use me...imagine what an inexpressible joy heaven will be for you when God reunites you with all the people you have loved, helped, and led to Christ...there will be much singing and dancing in heaven with you and your loved ones, girl! Hi Katie! I just wanted to say thank you for all that you are doing...and to let you know that you have inspired me with your humble service. I wanted to help spread your mission so I decided to do a blog post about your book and story! Thought I would share it with you! I also added your Amazima tag to my site! Katie, Your service is absolutely amazing and I plan on doing what you have done but in Haiti. I am a senior in high school and I recently went on a mission trip to Haiti and like you, I know it is my calling to go back and care for these children that made such an impact in my heart. You are my inspiration and I hope to have at least half the impact you have had in your short amount of time out there. Here is my Haiti blog if you or anyone reading this comment wants to see and share what my mission is about! What a beautiful reminder of the Lords love and faithfulness in our time of need. I will be praying along with you for complete healing, knowing that God can do much more than we can even imagine. I stand in the gap with you against doubt and pray for a miracle healing for beautiful Betty. Praying for you, dear sister in Christ. Katie- I'm sixteen and am so inspired by your obedience to God and you're desire to serve Him!! I've been so moved by your book and your blog, and have been waiting for what felt like months for you to post again! Thanks for sharing how He's worked in your life, as I pray for God to reveal His will for mine. Praying! We are the women's group of Amazing Place, Houston, Texas. We have been reading your book and are so very inspired by your work and your faith journey. Your words and work are not only a gift to the children you love but to many others around the world. We want you to know that we are praying for you and your ministry. Our struggles are not the same but our hearts are with God. We hope to hear from you, but until then, understand that one group of sisters in Houston, Texas will be lifting you up in prayer. Dont' ever hesitate to send us a prayer request. We have bible study every day. Thank you for your story. You are an angel on earth for all of us. That was good to read your story. See what God has done in your life and the lives of these beautiful children of Uganda! :) Our God is wonderful and I'm happy and amazed at all that He did in the lives of their children. Know that your life is an example, and that God is pleased with what you does. I prayed for you and will continue praying. A big kiss beautiful children in Uganda! I hope one day to meet you all . Katie you are truly inspiring!!!!! I want to make a change in this wold like you! I am in the middle of reading your book right now, and I am being so inspired and encouraged. Your commitment to those children is incredible. I have a special place in my heart for children as well, and my dream is to go into missions in a couple of years. That is why I am so inspired by the work you are doing. Keep up the good work - God will reward you for it! You have set a great example for my life! You and your family are in my prayers. Thank you! I have prayed and prayed about what God wants me to do with my life. I knew He wanted me to become a teacher and I am all for it, but something kept tugging at my heart. I realized God wanted more, He not only wants me to teach, He has something bigger planned. I have always dreamed of going to Africa. I ran across your book and blog one day and you have inspired me. His spoke to me through you. I thank you so much! I will pray for you and your community. you have faith, in a way, to relize you need faith even when it seems there's no point. I recently read your book! It was amazing to read your story and see the wonderful things that God is doing through you. I'm 17 and I feel like God is calling me to a foreign country to reach people in need--still working on which one exactly but your book has given me courage to continue to pray for guidance and even more excited to be a part of God's plan!! Thank you for all that you do and have done--thank you for saying yes to God's plan in your life! Betty is loved and comforted and everyone that has commented is praying! We all hope Betty will change quickly like Brenda. Katie, i wanted to tell you that your book has completely changed my life, and im not joking. comletely. You helped me find jesus through the miracles within your book and blog. i prayed every morning, before every meal, before i went to bed, and in the shower. i am only fourteen. i have completely changed my plans for the future in order to walk by faith and not by sight. Thank you so so much. Praying for Betty. You are beautiful Katie, I can see Christ in you and He is powerful. Our Father has used your book to cast off chains so I can live knowing I'm under His wings. I'm so thankful the Lord led me to reading it. May you continue in your obedience to Him as you face the enemy day in and day out and obediently follow after Him with your heart of love for others. My sister, Bekah, has en called to Africa as well. She has been on 2 10 day mission trips to Niger and is not oe her 3rd, a 6wk internshp with a pastor. Just as she was getting homesick, she found encouragement in your story once again. She knows she wll soon be there permenantly and will do work in and/or start her own orhanage. Our father was adopted, and we know and see the effects of that on his own life. I am an ESL teacher here in the States, but I cannot wait to be art of her ministry there one day! Thankyou for remiding us of the "DEMAND" God has placed on all of our lives. This is my first time commenting on your blog Katie. I marvel at what our Lord has put in your heart. I marvel at your spirit of willingness to listen and obey. It is your love of Jesus that brings Life and our Lord to the people you meet in Uganda and to many others around the world. I looked at Betty'e eyes in both pictures and saw something very special there, Love! I would love to join you in praying for Betty that our Lord will continue to bless her. Thank you Katie. I just finished your book here in Ohio and am simply blown away by your life and live for God, Jesus Christ, and the people of Uganda. Reading this has come at a crucial decision point in my life, where I feel God calling me, at 24 yrs old, to leave the church where I am a children & youth minister to go into overseas missions. To Latin America. I don't speak Spanish & I have no idea why God would call me there, but after reading your book, I have learned that if God calls, there is a reason & I must go. What an inspiration & example of God's unfathomable love you are. Thank you for reminding me that when God calls, I need to say yes. Wow that is so inspirational. It's my life dream to serve across nations one day and service the people who are continually neglected and dying. May God bless you in your work. I found your blog through a foster care group I am a part of on facebook. Someone recommended your book to another person in the group, so I had to check it out. I am sitting here reading through your blog and being amazed at the God we serve working through you and pouring through your words. I wish that there was more that I could do to help. I am a single mother to my one biological son, and a son and daughter that I am in the process of adopting through the foster care system, so finances are tight. For now, all I can do is pray. Please believe that I will pray, daily. Your heart for God's people has reignited something in me tonight that I thought was lost. So thank you for that, and thank you for being such a sweet, loving servant! To make a long story short, I too want to help these people and I'm now looking for a way, whether through Amazima or another ministry to come to Uganda and serve in some capacity! Your heart for these people has opened mine, and for that I am incredibly grateful. Sitting here with a lump in my throat and tears in my eyes, I don't know how to start. I just discovered your book and have already bought 4 more to give away. I was born in Nigeria, of Canadian missionary parents, 'way back in the 30's and one of our daughters is working in East Africa, so I understand a little of what you are doing. We love your total dependence on the Lord. He is totally dependable. My husband and I will be praying for you and following your work from now on. I have been sponsoring a young lady through Compassion International since 2009. She made it into their LDP program and now in October will be graduating with a teaching degree from Kyambogo University! I just read Kisses From Kattie... I wish I had read it the day it went to print. It has renewed a passion in me to pray for her and Uganda, even after she is out of the CI program. Thank you for telling us your story and the story of so many in Uganda. I hope one day my CI sponsor daughter will meet you, in a way, that will be like me meeting you - touching hearts together. Thanks. Hi, my name is AnnaGrace and my teacher is becoming a missionary just like you and in Uganda.Me and two other friends of mine read your book for our reading project and it changed our lives. For example, this week another friend and I are going to not eat for 24 hours so that other people like you can save them. your book is amazing! i loved it so much! keep up the great work! Hi Katie, I've just discovered your blog and have spent the last two days reading the whole thing. Words are inadequate for the gift you have given me. I have laughed, cried, danced for joy and sung with praise for Jesus while reading your blog. God has used you to reach much farther than Uganda. You may be doing the practical work of life there, but your heart for Jesus is working on many more worldwide. May God bless you, you brave, strong, inspiring and wonderful woman. You encourage me to live for God, to trust His beautiful plan for my life and to sing his praises to all I meet. And for that I thank you. I will be including your beautiful family and ministry in my prayers each day. Know that you are loved greatly. I'm praying for you and I hope that you will continue doing your good work out there in the beautiful country,Uganda. And I will be praying for Betty too. -Cast your cares on the LORD and he will sustain you; he will never let the righteous be shaken. I just finished your book and stand amazed! Thank you for sharing your love and faith. I have a Katie at home, 8 years old, your name will be easy to remember in our prayers, God bless! God led me to your book and I finished it today. It was exactly what I needed. and now seeing that still today you are continuing in your calling, letting the will and love of God prevail in your life is such a blessing to my heart. I now have a greater understanding of Gods love and how important it is in my daily walk with my Father. you will be in my prayers! -Louis LaRose. Praying for you, that the Father will carry you in this time of giving so much of yourself. He will fill your tank, over and over, abundantly - over flowing with love and joy. I was just about to buy your book at bookdepository.co.ul, I came to your blog to get a little feel for your ministry, instead I got the feeling you need my prayers more than you need my purchase. (I'll purchase too) but prayers come first. Blessings upon blessings. I just finished reading, "Kisses from Katie," while camping with 4 of my 31 children. Your book is so encouraging, and gave me so much strength to continue. My children come from Viet Nam, Korea, the Phillipines, Brazil, India and several US states. I have always wanted to work in Africa, as my husband's mother did. I found, though, that the Lord has called me to work here in the US. I will be reading your book to my kids, and sharing it with my friends. We will be praying for you, all your beautiful children and your organization. I am Falling in Love with your story! Is there a way we can subscribe by email? Katie, I recently lost my young sister to cancer. Up until the very end we all had unwavering faith that she would survive. My mother continues to ask me why she had such faith if God was going to take her. I'm going to show her this post, and I know your words will help heal her heart, as they have just helped heal mine. You and your family will continue to be in my prayers, thank you for being a blessing to me tonight. Katie! Thanks 4 the message. Katie, you are such an inspiration to me! I am in the process of reading your book and I can't tell you how much of a role model you are to me! I have always wanted to go and help a country in need and your book is making me long for God's wisdom and fulfillment even more than I have ever wanted it! I am 15 years old and in the future I would like to go on many mission trips and work in the eyes of The Lord. I have watched your videos as well. I want to help. It is absolutely amazing what you are doing in Uganda and someday I would love to be a part of it! You're book is absolutely amazing and I am pretty much crying at how much of an inspiration you are in my life. I am so happy that God led me to read your book! I feel like He is calling me to do something wonderful in my life like you. I will continue praying for Betty. I will also keep you and your beautiful new family in my prayers as well. My name is Vickey Labuschagne, I am a 21 year old student from South Africa. I have spent the past two weeks reading your book, talking to all my friends about it, surfing the web for more information and praying. I know that this is perhaps a long shot, that we have to get to know each other better (I really hope that we can), that your work in Uganda has become a lot bigger than merely helping out for a year, but I would love to come visit for a while, anytime from mid November to mid January. May God give you the strength to do what he asks and bless you! We miss you Katie! Hope you and your family are doing well. I love the thoughts where you said maybe he gave you the strong feeling that she would live so that she would have a passion to do so and be surrounded by the joy of your hope. Wow. May He continue to give you the strength, in every way, to carry out His grace and love in such trying circumstances. Thank you for sharing. Katie, I just finished your book...I did not know that I needed to read it, but God did. Thank you for loving. Thank you for teaching me. Thank you for praying for us. You won't hear the actual gratitude through this, but it has changed me forever, and now, I can start living more of the way God wants me to, loving the least of these! We are praying for you all! Thank you, Katie, for living for God, for loving as you let Him love through you! I just read your book. My life is changed forever! Amen! Now, I truly desire and know that we are instructed to love the least of these! Katie, I wish I could hug and hold you and tell you how much God loves you and how godly your love for His children in Uganda is. Your words in your book and blog are so anointed I find it difficult to read more than a couple of pages at a time. Thank you! I truly love you even though we have never met and I will keep you in my prayers. I am almost finished with your book and I wanted to stop by your blog. I am so encouraged every day that I read your book, I almost hate to know that soon I will have completed it! Although, I do plan on reading it again and again, I can see that I am going to be enjoying your blog just as much! Although the subject matter at times is heavy......your faith and hope and LOVE and determination to continue has changed and encouraged my heart and I don't think I will ever be the same. My perspective has changed, my heart has been enlarged, and my faith increased! I will be praying for you as you continue to "love the one in front of you"! Hello Katie! I read these verses today and felt the Lord was leading me to share them with you; I hope they are an encouragement to you! Thank you for sharing. For this witness of His grace and presence. I have read your all post on your blog,according to me this is one of best refrence to kids mats in web. I hope you will post more best articles in future. Wondered, Who can help to write my essay? If you need a professional writer, the writer help you get with our essay writing service can't be beat. I've just read your book. What an inspiration! Praying for you and your work. Am reading Kisses for Katie and found you have a blog. I can see why you don't have time to blog often....any way quality is more impt than quantity. I am so moved by your blog. I love children. I have been teaching in public school on and off for 47 years. Maybe one day I can come visit you in Uganda and love on these children. Keep loving, keep writing, you inspire me and many others. How is Betty doing? Praying for her and all of you. hi katie! i'm reading your book for a second time now and i just decided to come to your blog. uganda keeps showing up in my life. and i don't know what is to come. but i'm praying. praying for god to open the doors for whatever. my friend jade metz and her family are becoming missionaries next year. i see my husband and i traveling there sometime. not sure why. but someday. know that i prayed for betty right now. i begged god to heal her. to put that hope in you so that she may feel the hope and believe. she can be healed. he can do all things. I began reading your book today. Your love and your work is inspirational. continue God's work and thank you for loving like He loves. Thank you for posting this beautiful story. I was particularly touched by your insightful comment about the prayer of faith. I had a friend who recently lost her mother to cancer. She genuinely believed that God would heal her mother. And if her mother died, she believed God would raise her from the dead. Her mother passed away in April 22, 2013. My friend often wonders why God didn't answer the prayer. As you said in your blog, my friend's prayers surrounded her mother with "hope and high spirits". She gave her mother a wonderful gift -- by letting her know she was worth fighting for. I used to love reading your blog, but now I cante see it. The brown background is too dark. I'm praying for you and Betty! Are you okay??? You've only posted once since Katherine... we're all praying for your strength, and Betty's healing. God bless you and your girls always!!! Katie, God IS faithful, as you know. Thank you for sharing the joys and tears so authentically for all to read. I have had loss in life as well, but have seen that in spite of myself, the Lord has supplied just what I needed day by day. Persevere! May God bless you and your lovely family. Thank you, Katie. I recently read your book and this is my first time on your blog site. God is working through you to inspire so many. Thank you for saying yes to Him! Someday when we are able to meet you in person, you will be amazed at how far-reaching that "yes" was (is)! Praying for you and Betty. Hi Katie, just read your book in two days, shows how much I loved it , I am so inspired by your unselfish love, devotion to your children and to all the children you have helped and saved, you are a true joy to behold,,a wonder., and a wonderful human being, I look forward to getting to know you better on your blog. Last night a woman of humble courage and simple faith told me a story, and then asked me a question. This woman has prayed for friends and strangers, and she knows the healing power of Christ. when a woman who was almost a family member and almost a stranger was dying of leukemia, she and some friends went to the home of the sick woman and spent an hour or two encouraging one another and praying for healing of the sick woman. They said positive, uplifting things to one another, and the Christians were comforted by the hospitality of the sick woman and her family. The sick woman later died. My friend asked me - "Was it right for us to come into her home, and take hospitality from that family, and offer them hope? Were we a burden to them in an hour of sorrow?" In response, I told her what I could remember of this blog post and what you taught me: that Katherine was worth it! In response, my friend nodded her head and assented: "It is enough," she said. Thank you for sharing your pain with us to inspire us to seek the greater good that is Jesus!